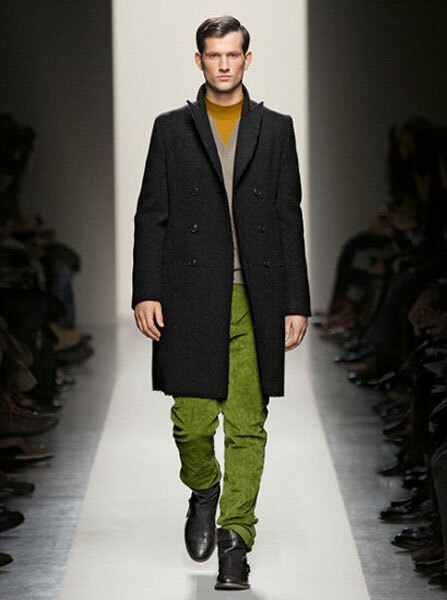 Peridot Green color is cheerful and optimistic unisex Bottega Veneta has emphasized in his Autumn-Winter 2011/2012 Men. It is a color which I love and which owes its name to the color of olivine,a mineral considered semi-precious stone. For a casual look, the velvet corduroy pants Peridot green that paraded on the catwalk men seem perfect to highlight a color in autumn. Not everything is black, navy, gray or chocolate. There are looks that cry out for bright colors. I like a splash of color in the winter wardrobe and this dose is colorful enough not to become harsh. For the most discreet, a supplement will be enough to give that warm touch of color. In the photo above, the model has a jacket for men of the color protagonist. Reviewing the extensive catalog of the brand, has the same green as accessories a braided leather belt, a scarf, a wool hat, a tie, even male models of bags. The one I show is a perfect bag for work and splurge style. In the 2012 Cruise collection A rectangular shopping bag looks the same color. I bet this color.